Speaking on Veterans Day at Arlington National Cemetery, President Obama says, "But as our service members return, many are discovering a new battlefield as they leave the military and search for civilian employment opportunities." Watch his entire speech. If the evening commute home from his Texas Army base includes a grocery store stop, National Guard Staff Sgt. Scott Gilbreath will purposely change out of his camo so that, ironically, he can blend with other customers. He appreciates the warm words yet acknowledges they also give him an awkward sensation, as if the courtesy is a bit misplaced. 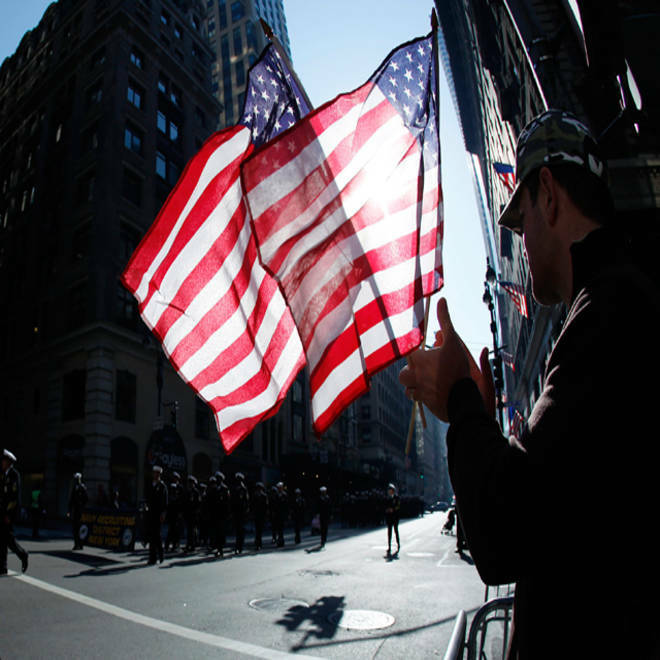 On the national holiday reserved to give veterans our most heartfelt and public appreciation, six current and former service members revealed to NBC News that hearing “thank you for your service” routinely leaves them feeling uneasy. Their reasons vary. Sanders used the word “us” because veterans say this slight tinge of disquiet is a prevalent phenomenon throughout the U.S. military and much of the veteran community — a little-discussed fact of life that simply comes with wearing the uniform. Please don’t misunderstand, each of the six veterans say. They are sincerely grateful for your respect. But they’re also not sure how to respond. And many feel unsettled by the notion that thousands of their brothers and sisters — in Afghanistan, Iraq and wars before — made the supreme sacrifice. They deserve the “thank yous” but aren’t here to accept them. In contrast to those who didn't come home or who left body parts behind, many veterans and service members believe they haven’t done anything extraordinary to earn your individual admiration. They just completed (or are performing) their assigned tasks. They were compensated for the work. In return, some also got college educations plus federal health care and pensions. They’ve already received what they were due, what they were promised. No “thank yous” are needed, some veterans say. “I’m no war hero. I did what I was asked to do, but nothing special,” said Sgt. First Class Ed Jarveaux. He began his Army career in 1999. He noticed that unsolicited, civilian expressions of gratitude emerged after the 9/11 attacks. He served in the Washington, D.C. area on Sept. 11, 2001 and now is an Army reservist. “I volunteered. I didn’t do it for free,” Jarveaux said. Two years ago, after he entered a grocery store in Fairbanks, Alaska, to buy Thanksgiving provisions to cook dinner for some military buddies, a random woman spotted him and told the checkout clerk that she would pay for Jarveaux’s purchases. “I thanked her. I’m fairly certain, though, that I was at a higher salary than the woman. This would be, maybe, why I felt a little guilty” about that gesture. “But it is definitely complex — why we feel this way. There are so many guys who had it a lot harder that me, who made more of a sacrifice. It feels a bit like that ‘thank you’ belongs to someone else,” Jarveaux said. “I’ve made my peace with the fact that they can’t find the wounded warriors or the families of someone who died in service to offer that thank you. So it’s my responsibility to accept it graciously." Spontaneous “thank yous” still take Grant Moon by surprise — and he doesn’t startle easily, having spent parts of 2007 and 2008 in Baghdad during a 13-year career as a soldier and captain in the Army National Guard and Army Reserves. Then again, the psychology of this larger unease seems fairly simple to diagnose. These are men and women who willingly sign up to be exhaustively taught and trained to become part of a vast collective, to think of the greater good and the larger mission, to work seamlessly and selflessly with the soldier, sailor, airman and Marine next to them. They see themselves as teammates, not as individual players. One of the few moments when many veterans feel fully relaxed with a “thank you” is when someone with a shared experience offers those words. And then there are those veterans who feel they should be sharing their own appreciation with us. So should we be thanking veterans? “I think people are doing fine. I think just saying ‘thank you’ is fine. I guess I wouldn’t want it to change at all,” Jarveaux said. Starich, however, suggested some tweaks to the current phraseology of military gratitude.